“Barbecue — it’s not just for breakfast any more.” That’s one of the mottos of the KCBS (Kansas City Barbecue Society), and it serves to remind us that breakfast does too belong on the grill. I don’t know about you, but I love firing up one of my grills early in the morning — enjoying the peace and calm before everyone else awakes. So what’s for breakfast? 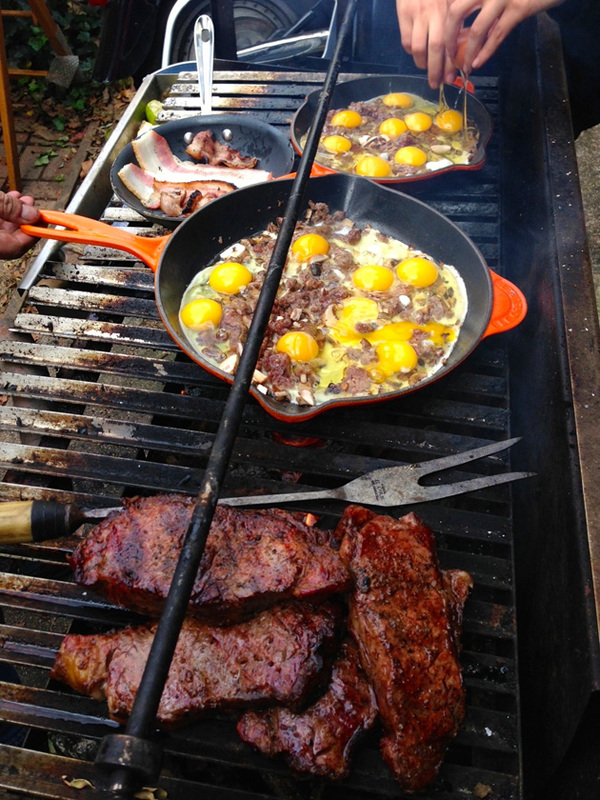 How about steak and eggs Grillworks style — cooked on this Argentinean style grill over a fragrant oak log fire (see photo, above). Yeah, I know what you’re wondering: Why didn’t they direct grill the bacon over the wood fire, too? To avoid flare-ups. 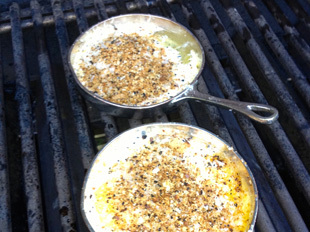 Another Raichlen favorite: shirred eggs on the grill. Crack eggs into a buttered skillet and top with heavy cream, grated Parmesan cheese, fresh herbs, and homemade bread crumbs. Crumble prosciutto “bacon” (fried ham) on top as an optional ingredient. Indirect grill with a whiff of oak smoke. Breakfast of champions, indeed. What do YOU like to grill for breakfast? Tell us your favorite dishes, inventions, and recipes, and of course, drive us hungry crazy with your photos. Join our BBQ Board and share your creations in the forums!